ILOILO CITY, Jan. 31 (PIA) -- Three police officers designated as Information Officers in their respective units were given the PNP Commendation Medal or the Medalya ng Papuri, during the 21st PNP Foundation Anniversary. PO3 Francisco B. Lindero, Jr., president of the Association of Government Information Officers-Western Visayas, was awarded for winning 2nd runner up and the Most Active Blogger Award during the 1st Journ.ph Information Officer Blogger Contest, jointly implemented by Smart Communications and the Philippine Information Agency-6. As AGIO president, Lindero has initiated various trainings to upgrade the skills and knowledge of the Information Officers, besides his own personal initiatives to improve his writing ability by maintaining a column in local publications. Another award recipient was PO2 Nida L. Gregas, of Aklan Provincial Police Office, for having been chosen one of the Best Performing Information Officers by the PIA-6. 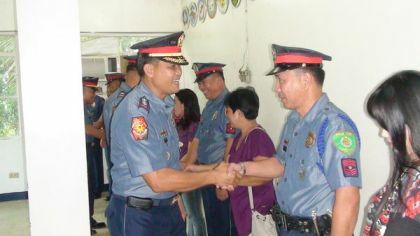 Gregas is among the 46 adjunct instructors for the Transformation Program in the entire PNP organization. PO2 Ria May S. De La Cruz is another award recipient, for being among the Best Performing Information Officers for 2011. De La Cruz is known for her active advocacy, information dissemination activities, and for re-organizing the Antique PNP Press Corp, which contributed to the good media relations they have established. The awarding was done during the regular Monday Flag Raising, and the celebration of the 21st PNP foundation Anniversary, January 31, at Camp Delgado, Iloilo City. Other police awardees, recipients of the Medalya ng Kasanayan were Police Supt. Antonietto Y. Cañete, PSI Anthony G. Grande, PO3 John Derrick G. Capunong and PO3 Rune Quirico B. Bandola, of Himamaylan City Police Station, Negros Occidental. On the other hand, Certificates of Appreciation were given to officials and members of the Barangay Peacekeeping Action Team, of Brangay Nazaret, Buenavista, Guimaras, for their invaluable assistance during a hot pursuit operation.